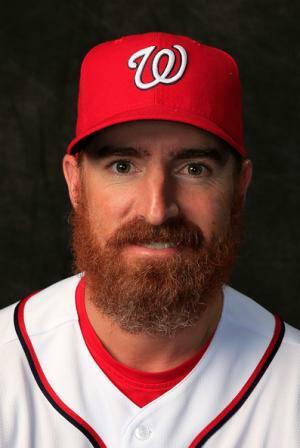 Born David Adam LaRoche on the 6th November 1979, in Orange County, California USA, Adam is a retired professional baseball player who played as first baseman in the Major League Baseball (MLB) for twelve seasons, including for the Atlanta Braves (2004-2006, 2009), Pittsburgh Pirates (2007-2009), Boston Red Sox (2009), Arizona Diamondbacks (2010), and Washington Nationals (2011-2014), after which he retired. Have you ever wondered how rich Adam LaRoche is, as of mid- 2017? According to authoritative sources, it has been estimated that LaRoche’s net worth is as high as $35 million, an amount earned through his successful career as a professional baseball player. Adam is the son of Dave LaRoche, who was a pitcher in the MLB and baseball coach, and his wife Jennifer. Adam has a younger brother Andy, who also plays baseball and is currently a free agent. Adam went to Fort Scott High School, where he started playing baseball and earned several honors, including being named as All-American in his senior year. While in high school, Adam was diagnosed with ADHD, which later resulted in numerous gaffs in professional games, However, after high school matriculation, Adam enrolled at Fort Scott Community College, where he continued to play baseball under his father Dave, who at the time was the head coach of the university’s team, but transferred to Seminole Community College the following year. While there, he was named MVP of the Junior College World Series, while he was also an All-American. Before his professional career started, Adam was two times drafted by the Florida Marlins in 1998 and 1999 amateur drafts respectively, but he chose not to sign. Then in the 2000 MLB Draft, he was chosen by the Atlanta Braves and signed his first professional contract. He spent four seasons in the minor leagues before making a debut for the Braves in the MLB, then in his rookie season, Adam posted a .278 batting average, platooning with Julio Franco that season, and also the next one. In 2005 his form oscillated from great to poor, as he had a streak of 17 games in which he posted a batting average of .385, but also had 19 games in which he had only a .105 batting average. The following season, Adam was the starter for the Braves at first base, and had a career-high season with a .285 batting average, 90 runs batted in, and 32 home runs. However, the Braves still decided to trade Adam, and he finished with the Pittsburgh Pirates but didn’t have much success in his new team. Then in 2009, he was sent to the Boston Red Sox, but after only six games he was traded again, this time he returned to his native team, the Atlanta Braves. His contract then expired and he signed with the Arizona Diamondbacks for $4.5 million for one year. He played in 151 games and had a .261 batting average, while he made 25 home runs, and 100 RBI. After his stint with the Diamondbacks ended, Adam became a new player of the Washington Nationals, on a two-year contract worth $15 million, which considerably increased his wealth. While in Washington, Adam played his best baseball, earning a Golden Glove Award, and Silver Slugger Award in 2012. He received a contract extension in 2013 worth $24 million over two years, which incorporated a team option in 2014, which wasn’t exercised. Instead, he signed with the Chicago White Sox on a two-year deal worth $25 million. However, Adam decided to retire before the contract expired, leaving $13 million on his contract. Aside from baseball, Adam has been involved in the entertainment industry; alongside his colleague athletes Chipper Jones, Tom Martin, Ryan Langerhans, Luke Bryan, Jason Aldean, he is co-owner of the reality TV show “Buck Commander”, aired on Outdoor Network. Regarding his personal life, Adam his married to Jennifer, with whom he has two children. Adam is a devout Christian.